required for B1, and introduces some of the competences of B2. are typically ready to sit the Cambridge PET examination. 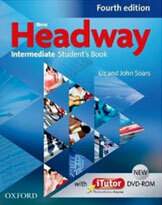 the New Headway Intermediate workbook, and also the New Headway Intermediate class audio. and the New Headway Intermediate workbook.